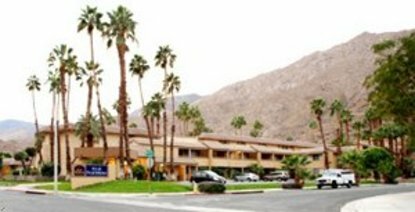 Escape to this secluded Palm Springs hotel - a relaxing retreat for an ideal vacation experience Newly remodeled in 2007 The Best Western Inn at Palm Springs is a secluded retreat amid lush landscaping and the rugged San Jacinto Mountains. Guests to this hotel will find spacious rooms and thoughtful amenities for a most pleasurable stay. Visitors to this Palm Springs hotel will be treated to complimentary breakfast every morning and free coffee service all day. The Best Western Inn at Palm Springs is the only hotel in the area offering 24-hour access to its pool, sun deck and spa for guests to relax around the clock. Each well-appointed room features a coffee/tea maker, refrigerator, microwave, iron/ironing board and hairdryer. Guests will find this hotel is situated near Palm Spring's favorite attractions. Within a short drive visitors will arrive at fine restaurants and shopping, the majestic Indian Canyons, Boomers Family Entertainment Center, Palm Springs Tramway, Knott's Soak City and the prestigious Palm Springs Desert Museum. Enjoy the prime location of the Best Western Inn at Palm Springs Visit bestwestern.com today for a guaranteed low rate.